Rich, Chocolate Coconut Bread is topped with toasted coconut and filled with sweet chocolate morsels, makes a perfect breakfast or a snack anytime of day. Last Wednesday morning I was really wanting bread for breakfast, but since I hadn’t planned ahead, it didn’t happen. So that afternoon, I got inspired and thought what if? I love chocolate and I love coconut. For the past few weeks now, an idea has been floating around in my mind, so I pulled out a ton of ingredients, mixed up this bread and viola – a new recipe was born! If the smell of toasting coconut doesn’t get you, the finished bread will. 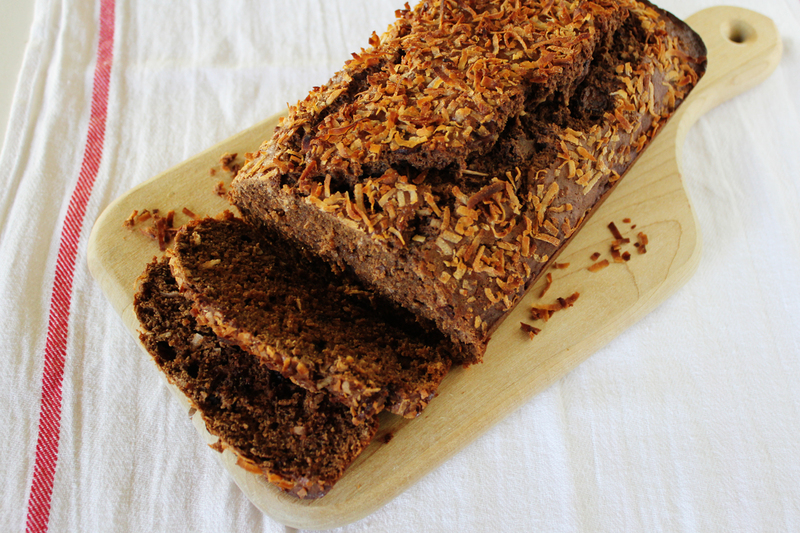 It’s a rich, chocolatey, coconut filled loaf with sweet chocolate morsels throughout. As a breakfast or snack, this is one bread I am sure you will enjoy; happy baking! Preheat your oven to 375º and prepare a large loaf pan with baking spray. In a large bowl beat together the eggs, brown sugar, milk, coconut oil, applesauce and vanilla. In a medium bowl whisk together the flours, sugar, toasted coconut, baking powder and salt; incorporate the dry mixture into the wet, until just moist. Stir in the chocolate chips and spread the batter into your pan, sprinkle the 1/4 c reserved coconut on top. Bake for 40-43 minutes; until a tester comes out clean. What a great bread recipe! I love the combination of flavors, and that you used almond milk. I think I just drooled on my keyboard a little bit. Thanks ladies, I would share if I could! the smell of toasted coconut ALWAYS gets me! may be my favorite smell ever! These look so darned good. Thanks for sharing. You drew me in with this one: Two of my favorite flavors combined into one beautiful loaf! Thanks for stopping by! This recipe sure is tasty!